Dr. Jessica Kemper is an expert and advocate for the endangered African penguin. Formerly the head of Section for Namibia's Ministry of Fisheries and Marine Resources (MFMR) and responsible for the conservation management and rescue of the country's seabirds, Jessica now heads the African Penguin Conservation Project. She continues to research Namibia's dwindling penguin population to find ways to improve their conservation status and runs the Seabird Rehabilitation Center in Lüderitz. Population numbers for African penguins have decreased to just 55,000 today from an approximate 1.5 million figure in 1910. 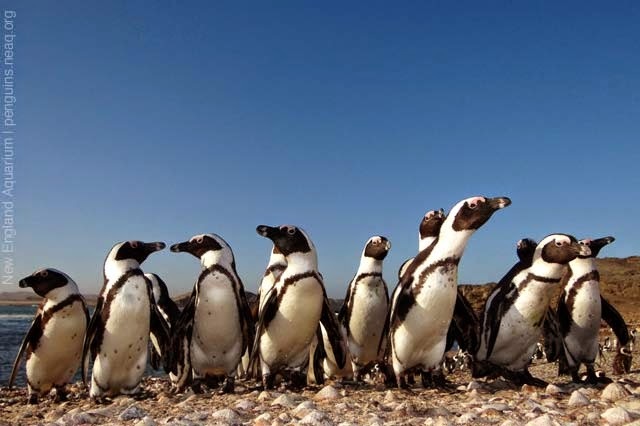 In this series of posts about an uncooperative African penguin, she retells one particular experience while conducting field research of wild penguins. If you're behind, catch up with Part 1 and Part 2. Wednesday, February 25, 2009: We arrive at the colony just before sunrise, fully expecting our penguin to be there. Alas, no sign of her. Her chicks have teamed up with the neighbor’s chicks and all four are guarded by one adult penguin. Oh well, it’s only day two, we’ll try again tomorrow morning. Halifax Island welcome committee: African Penguins tend to be a curious lot. Thursday, February 26, 2009: We arrive at Guano Bay at 6:30 am, but discover that the wind is already too strong to paddle to the island. The sea is whipped into foamy curls all over the bay and we don’t think it is worth the risk of getting blown straight to Brazil. Besides, we’ve got Plan B, the use of the Ministry of Fisheries and Marine Resources’ research vessel, the !Anichab later that day to do a routine bird census on Halifax Island. Of course the odds of seeing our penguin in the middle of the day are not that great—the best chances are around dawn and dusk when penguins arrive back from sea to feed their chicks. And, as expected, our penguin is not around; at least “our” chicks look well-fed. But what if the wind stays strong and we can’t paddle across again the next morning? Staying overnight at the island is not really an option; there is no shelter on the island and it is covered in bird ticks that cause us to break out in massive, itchy welts. We are not really too keen on that prospect. Friday, February 27, 2009: Back at Guano Bay at 6:30am. Wind conditions are marginal and we risk the paddle. Katta misjudges a wave and gets bucked off her paddle-ski. Our equipment is packed in waterproof backpacks, so no harm done. On the island we don’t bother to change into our dry clothes but head straight for colony 2. Surely, she has to be back. She isn’t. We stand and wait. Freezing in our wet wetsuits. Scanning the beach. Scanning the colony again from all angles. Then the wind picks up and we have to head back. This time I get dumped in the surf, but that’s not unusual. We drive back with the car heater on full blast. And now we are getting worried. 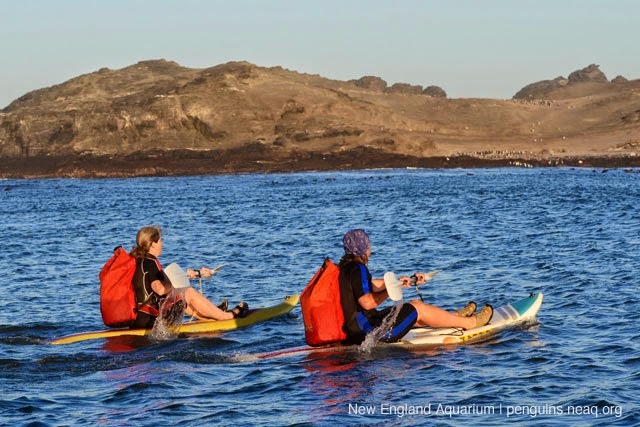 En route to Halifax: Paddling to “the office” – Katta on the left, Jessica on the right. The wind remains strong throughout the day, but we give it another try in the late afternoon. We drive out to Guano Bay, armed with paddle-skis, wetsuits and my telescope. Perhaps, if we are lucky, we might get a glimpse of her from the shore. We take turns scanning the colony and the landing beach until it is too dark to see anything. Still no sign of our penguin. Neither of us sleeps well that night. Keep reading with Part 4 of this series, as the quest to find the missing penguin—and GPS logger—continues. Can't wait, need more penguins right now? Visit the Aquarium! It's the summer of Penguinology right now. So not only will you be able to observe more than 80 penguins, you'll be able to learn the most wild and surprising facts about these beloved birds.